One of the most popular Messenger app in the world, WhatsApp, has been into development and brought several new features and functionalities throughout these years. Some of these new features include End-to-End Encryption, WhatsApp Status, Video and Voice Calls, WhatsApp Web, and much more. Now, the latest feature added to WhatsApp Messenger is the Group Calling for Voice and Video. So download the latest version of WhatsApp to get group calling functionality. Until today, we could only start a video or audio call with one participant. Henceforth, you can add multiple participants by simply tapping the “add participant” button in the top right corner during a live video or voice call. 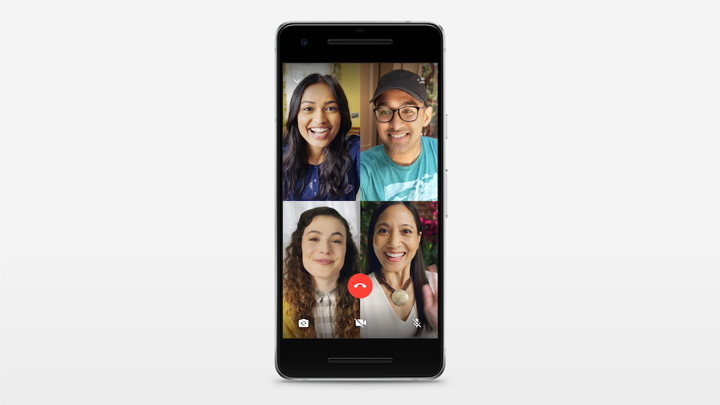 However, you can only add up to 4 participants in one group video call or group voice call. You can make a group call with up to four people total – anytime and anywhere. Just start a one-on-one voice or video call and tap the new “add participant” button in the top right corner to add more contacts to the call. Group calls are always end-to-end encrypted, and we’ve designed calling to work reliably around the world in different network conditions. The feature is currently rolling out on the iPhone and Android versions of our app. As WhatsApp is the most used messenger in the world, it will be very useful and convenient for a lot of people. Make sure you have the latest version of WhatsApp Messenger. You may also want to enroll into WhatsApp Beta as it gets the latest features before the official ones. Visit this link to become a WhatsApp beta tester. Once enrolled, you will receive an update in the Play Store. Update and launch WhatsApp Messenger. Swipe to get into calls section. Tap on the new “add participant” button in the top right corner to add more contacts to the call. Note that, all of your contact’s WhatsApp need to be enabled with this feature to start a group video or voice call.